NPR– It’s afternoon, and in a spacious courtyard in Accra, Ghana, children sit at tables and talk to adult mentors. Pat Wilkins, a youthful 52-year-old, firmly asks what they’ve been learning in school. She peers seriously at them through her glasses. And then “Aunty Pat” — as the kids call her — cracks a smile. It’s this blend of discipline and nurturing that’s the foundation of BASICS, a nonprofit organization Wilkins started in 2001 that aims to change lives by guiding low-income children through school and preparing them for skilled jobs. BASICS has since worked with 1,300 children. (The name is an acronym for “brothers and sisters in Christ serving,” although the organization is secular.) Each day some 85 boys and girls, ages six to 18, arrive after school for tutoring, music lessons, computer classes and more — including a hot meal. They hail from Chorkor, a poor fishing neighborhood near a gritty beach crowded with wooden boats. It’s the sort of place where students typically sink rather than swim. “I had so many difficulties going to school,” says 20-year-old Ophelia Ashkar, who started coming to BASICS in first grade. She credits the organization with pushing her to finish high school. Now she’s making and selling bed and table linens, and wants to become a firefighter. Wilkins understands the appeal of going to where help is needed. The New York City native was raised by a single mother in Queens. After graduating from Queensborough Community College and the Fashion Institute of Technology, she started a career working for a textile supplier. She led a “high maintenance life” with expensive vacations and a BMW. She started to diverge from that path in her late 20s, when she read an article in the New York Daily News about a homeless shelter on 19th Street in Manhattan and started volunteering there. The experience opened her eyes to deep poverty and social injustice. Wilkins felt compelled to do more. In early 2000, Wilkins went to Pavlovsk, Russia, as a missionary through the United Methodist Church Volunteer Mission and worked with physically and mentally challenged children. After a few months, Wilkins wanted to go to an English-speaking country in Africa, though she didn’t know much about the continent except that it needed help. She ended up in volunteering in schools in Accra. Wilkins discovered there were some similarities between her African-American heritage and Ghanaian culture, such as the black-eyed peas she knew from home. Fufu, Ghana’s staple food made of pounded cassava, reminded Wilkins of dumplings. 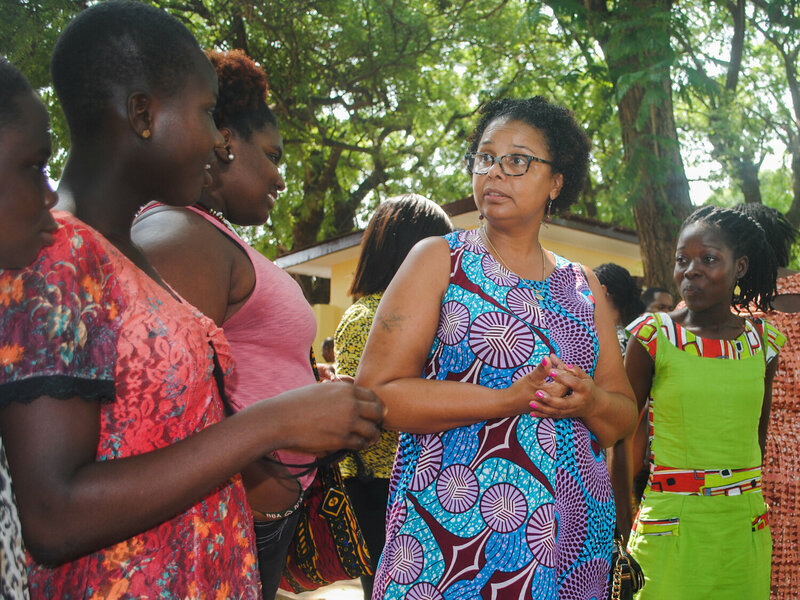 But she couldn’t ignore the differences, especially the fact that there were hardly any social services and resources in a developing country like Ghana. She started sponsoring children’s fees to attend public school and then asked friends and family back home to do the same. But Wilkins found that paying tuition wasn’t enough to keep kids from dropping out. Additional fees for books, uniforms and meals were too costly for poor families. Many parents were illiterate. Without a supportive environment at home, kids were easily derailed from school and at risk of early pregnancy, child and bonded labor, and another cycle of poverty. So Wilkins took $60,000 of her savings to start BASICS. The program wasn’t an instant success. Many children continued to drop out of school. “Even those who stayed in school weren’t doing well. They didn’t get passing grades,” Watkins says. In 2004, Wilkins instituted some big changes. Instead of borrowing space, BASICS established its own three-story building with an after-school center. She hired staff and organized international volunteers to help kids with homework and computer training and to provide social services for families. Many children were underfed at home and had the brittle, reddish hair that signals malnutrition. BASICS began offering free meals to motivate them to keep coming. To give extra support to at-risk girls, Wilkins set up a boarding house in 2010. Wilkins’ experience being raised by a single mother influences her work “because it’s my life and it’s the reality of the community,” she explains. A 2016 survey of BASICS’ beneficiaries showed that at least 61 percent of children were being raised by single mothers or by grandmothers. “What we lacked and what we were given teaches me what to give these children,” she says. In 2006, BASICS sent its first student to university – a milestone in this neighborhood where few kids go on to higher education. Since then, five others have enrolled in university. And in 2012, the Diamond Family Foundation, started by Bob Diamond, former chief executive of Barclays, became BASICS’ first major donor. The foundation helped BASICS hire staff and develop training programs as well as funding a fellowship program and giving guidance on planning a sustainable organization. The foundation also advised that Wilkins pay herself, so in 2012 she drew her first salary from BASICS. Other funding comes from corporate and charitable organizations, including the African Mining Service, Zen Petroleum, Springfield Gardens United Methodist Church. Today, BASICS has an annual budget of about $350,000. In her adopted home in Ghana, Wilkins has evolved too.